Dictation on the iPad and iPhone converts your words into text, it can make typing in iOS easier but it’s also easy to accidentally activate with an inadvertent touch. It works quite well, you just press the microphone button on the iOS keyboard and it listens to what you say, and then converts your speech into text on the iPhone or iPad. For a variety of reasons you may want to either turn Dictation on or off, and if you don’t use Dictation it’s simple to disable which also hides the little microphone button from appearing on the keyboard. This tutorial details how to disable or enable Dictation in iOS for iPhone and iPad, so you can toggle this featureoff and on as needed. 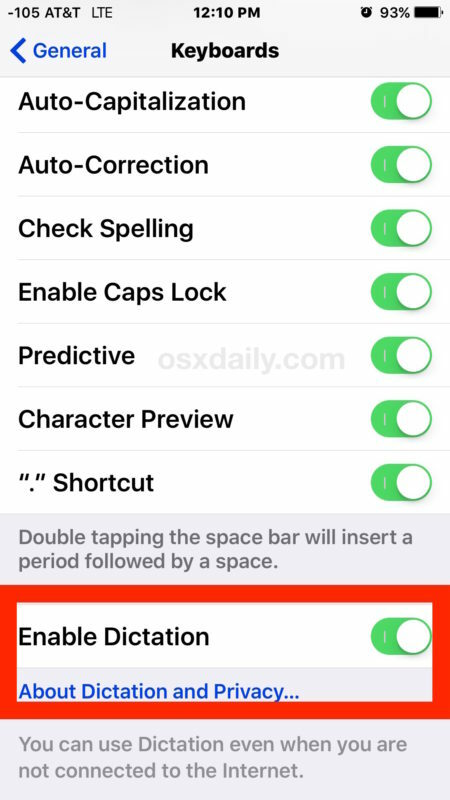 Note that if you disable Dictation, the microphone button on the keyboard will also be disabled. When you attempt to enable or disable Dictation, you will receive a message that warns “The information Dictation uses to respond to your requests will be removed from Apple servers. If you want to use Dictation later, it will take time to re-send this information.” That’s fairly self explanatory, but basically if you turned it off and then re-enable the service it has to reupload voice data before it works again. Similarly, if you’ve never used the feature and are turning it on for the first time, it will have a popup informing you that the Dictation data will be uploaded to Apple. The reason your voice data is uploaded to Apple is so that it can be processed and then accurately transcribed on remote servers voice recognition servers, rather than trying to squeeze that process out locally on the device. Dictation is a great feature and we would generally recommend having it on due to it’s wide range of uses for iOS. Turn it off and on again to reconfigure Dictation to your voice too. I noticed after a friend was messing around with mine that it became inaccurate, flipping the switch back and forth made it normal again. Works on my iPad but not my iPhone 4s. Does it work on iPad 2 or ipad3 only? My iPhone 4S doesn’t have the ‘Dictation’ option. Have the author actually tried it on an iPhone 4S? The dictation on/off only appears on iPhone if you upgraded to iOS 5. If the device started out with iOS 5, that switch is missing. I have iphone 4S and used Dictation a lot. My wife accidentally turned it off when adjusting some settings on my phone while driving. Now the setting no longer is there. How do you reactivate it? There is no… “Dication On/Off” as I’d imagine there should be (and probably used to be). Bug? If you have a newer version of iOS, and you have any iDevice that supports it, go to Settings.. General.. Siri.. When you turn on Siri, the dictation or MIC button should appear on your keyboard. Hi. I upgraded my iPhone 4s yesterday and am no longer able to dictate and I used to love it. I chose “enable dictation” during the upgrade and just followed your instructions and it is in fact enabled. But the microphone cannot be selected for use, although the button is on the screen in a lighter color. What next?? Stupid. I don’t have “dictation” button. This is so dumb. No apostrophe needed for its. For anyone who sees the mic for dictation on the keyboard but it is light in color and won’t let you select, keep in mind that you can not be on a phone conversation using the speaker in other words “Hands free”. And also a note to keep if you like to stream or play any type of audio in your car from your phone not sure about iPad though. And the phone and stereo or output device are connected with auxiliary connections, you can use dictation while music or games with sound or movies…..etc is playing from your phone but it will immediately mute the all audio output until you are done dictating. Oops sorry I have an iPhone 5s so I’m not sure about others. Also if I choose to use Siri rather than dictation like I am now will it recognize my words and put them to text more accurately and faster than dictation dictation is always scrambling my words and using words that are inappropriate and or offensive and cause also if I choose to use Siri rather than dictation like I am now will it recognize my words and put them to text more accurately and faster than dictation does? Dictation is always scrambling my words and using words that are inappropriate and or offensive and cause for debate with my boyfriend and my employer because it is not recognizing my words correctly and texting the next best thing I guess. This is a real text message that I sent to my boss and his wife looked at the phone and the way it seemed is that he was gonna be doing something with me over the weekend and by something I mean not good. I was saying to dictation, ” is there anything that I may assist or provide to you in the next hour while I’m available? Unless you prefer I come in for a couple of hours this weekend? I will have available time on Saturday and Sunday. Just let me know and I will. Be here to do whatever you feel is necessary. This is what” Dictation sent ” is there anything that I my a** t**s or provide to you within the next hour while I’m available? Unless you prefer eye command for a couple of ours this weekend? I will have available Time on Saturday and Sunday. Just let me now and I will be here to do whatever you feel is nice is airy” no joke at all. I am so serious!!!!! actually texting someone :) now I don’t think it will get posted. It was just asking if Siri is more accurate and faster than dictation at putting my words into text. Dictation Sends in appropriate word replacements that are the cause of debate between me and my boyfriend and also my employers wife who read them….oops. I now double check all words in dictation. Again sorry for the inappropriate wording. But HELP does anyone know? The advice for switching off dictation does not work! I have a strong Scottish accent and siri does not work with that. 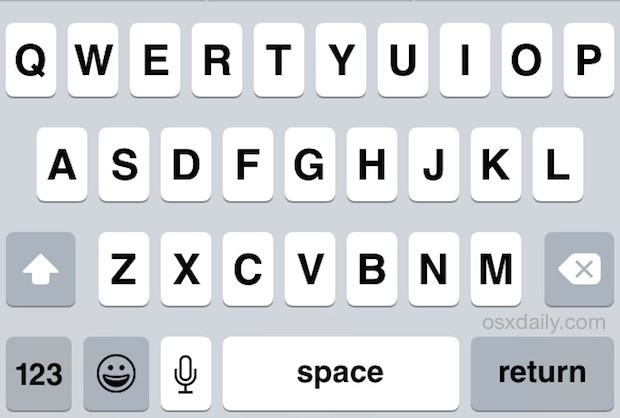 I want rid of the microphone icon on the iPhone 6 plus keyboard. I want completely rid of it so how do I do that? Last graph, “it’s” should be “its.” Thanks for the tip! I can’t get the microphone or send websites from google anymore. I hate google. It stopped working. Use to love it a box with a line over it doesn’t do anything either. I lost my ability to text since the last software update. Going to Settings-General- Keyboard-Dictation- on/off does not work. This is such a useful post if you need to adjust dictation settings, thanks it helped me a lot because I have no idea what I’m doing without tutorials like this. Thanks.